(by Daniel Barbarisi, The Wall Street Journal) – They called it boot camp, and the name was well deserved. Coach Brian Butterfield and his young pupil would hit the field early and work until noon, ground ball after ground ball pounding the young, skinny shortstop in the chest, hundreds in all. Afterward, they would assess what went right and wrong, and then head back to the field to do it all again. Day after day, for 35 straight days. 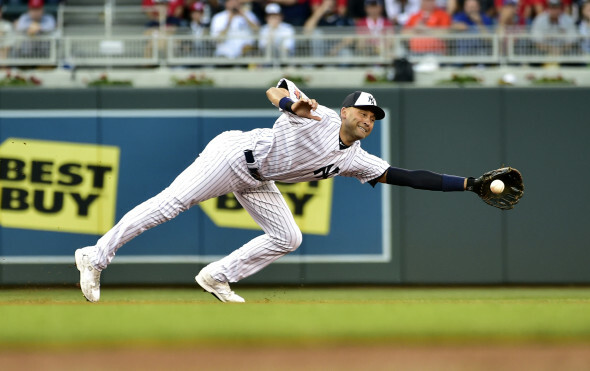 At the end of it, Derek Jeter was no longer a gangly kid who couldn’t make the plays. He was a professional shortstop. These days, it may seem like Jeter emerged fully formed from Joe Torre’s head sometime around 1996, ready to win awards and lead the Yankees back to the top of baseball. But as the Yankees prepare to celebrate Jeter’s career on Sunday with a day devoted to his achievements, it’s worth remembering that nothing could be further from the truth. Shortly after being selected with the sixth overall pick in the 1992 draft, Jeter was in danger of becoming a bust. His minor-league career almost stalled because he couldn’t play defense, and he had to work doggedly to avoid flaming out. In 1993, Jeter’s first full season in the minor leagues, the future Yankee captain was a rangy, lanky kid whose baseball fundamentals were in need of improvement. He had the athleticism and intelligence to succeed, but his glove was a disaster. In 126 games, Jeter made 56 errors at shortstop, for an embarrassing .889 fielding percentage. Jeter’s defense was so poor that there was talk he might need to be moved off shortstop, perhaps to center field. Enter Butterfield, and his boot camp. Jeter, 19, was assigned to work with Butterfield – then a Yankee minor-league infield instructor, now Boston’s third base coach – in Instructional League in Tampa. He reported to the Yankees’ minor-league complex on Himes Avenue, and the two got to work. Butterfield saw a talented kid who was the equivalent of a lump of clay, and he began to mold him. “He was fresh out of high school, so there were an awful lot of fundamental things that he was lacking, which is something we’re confronted with all the time with kids coming out of high school,” Butterfield said. The days began early, and Butterfield gradually broke Jeter down and rebuilt him. Jeter had suffered a wrist injury that kept him from swinging a bat, so every day was defensive work from morning until night. Jeter had several bad habits that Butterfield needed to correct. First, he was too timid on ground balls, though his throwing arm was considered an asset at the time. Butterfield taught him to attack the ball, to charge forward toward home plate. Jeter also had a bad habit of keeping his glove along the ground when moving for a ground ball. They eliminated that with tireless repetition, trimming wasted motion and fine-tuning his movement. Then it was footwork. Butterfield taught Jeter to set and use his feet correctly to make the long throw from a variety of angles. The coach was struck both by how quickly Jeter learned the lessons, and how eager he was. Like many young big-league prospects, Jeter had been the best player on the high-school field, and he relied on his natural tools to succeed. But his troubling minor-league season of 1993 made it clear he could no longer get away with that, and he embraced Butterfield’s tutelage. “I told my wife during the whole process that, after being around the guy, I looked forward to it more and more each day just because of his personality, how excited he was every day to do something different to try to get better,” Butterfield said. Jeter called the camp “five of the most important weeks of my career.” The results were immediate. In 1994, Jeter made only 25 errors for a respectable .959 fielding percentage. Eventually, he developed into one of the most sure-handed shortstops in baseball history, with a career .976 fielding percentage that ranks 30th all time. It was a remarkable reconstruction, Showalter said, and one that has stuck with him when he watches young players today. “Through the years it’s actually been a lesson to me, for not saying that a guy can’t play defense at a young age,” Showalter said. Butterfield and Jeter reconnected at the All-Star Game this summer in Minnesota, where Butterfield was on the American League coaching staff, hitting grounders to Jeter for the first time in more than a decade. Butterfield looks back on that time fondly, saying it had one of the greatest impacts in his baseball life. He noted that Jeter is quick to give him credit for the assist whenever possible, but Butterfield claims Jeter would have fixed his problems with or without the Himes Avenue boot camp. Published Sept. 5, 2014 at The Wall Street Journal. Reprinted here Sept. 18, 2014 for educational purposes only. Visit the website at wsj .com.